I do not mind what language an opera is sung in so long as it is a language I don’t understand. You must not miss Whitehall. At one end you will find a statue of one of our kings who was beheaded; at the other, amonument to the man who did it. That is just one example of our attempts to be fair to everybody. I do not mind what language an opera is sung in so long as it is the language I don’t understand. Sir Edward Victor Appleton was born in Bradford, West Riding of Yorkshire, England. He was an English physicist. 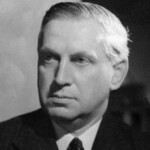 Knighted in 1941, he received the 1947 Nobel Prize in Physics for his contributions to the knowledge of the ionosphere, which led to the development of radar. He was professor of physics at King's College London and professor of natural philosophy at the University of Cambridge. From 1939 to 1949 he was secretary of the Department of Scientific and Industrial Research.